Industry Apex body, Associated Chambers of Commerce of India (ASSOCHAM) has been playing a catalytic role with regards to moulding the Trade, Commerce and Industrial environment of the country. In the ninth year of the Higher Education Summit, the country’s best educational institutions and universities were awarded in 21 different categories in New Delhi. 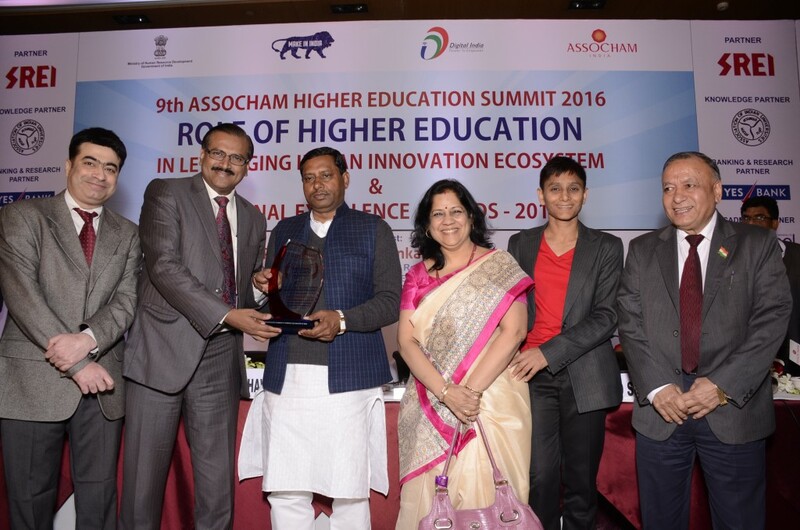 Union Hrd Minister of State, Prof Dr. Ram Shankar Katheria presented the awards. ASSOCHAM presents National Education Excellence Awards to those who have contributed significantly in the field of improving the quality in education, delivery mechanism with emphasis on world-class research and innovations in enhancing the development of quality education, with employability. The submitted entries were evaluated on the following criteria: Innovation, Scalability, Ability to Overcome Challenges, Achievements, and Impact Potential. Welingkar Institute received the ‘Best Innovation Institute of the year‘ award. It was a double honour for us as Group Director, Prof. Dr. Uday Salunkhe, received the ‘Best Education Entrepreneur of the year’ award, for his outstanding and visionary contribution towards establishing and developing WeSchool as a Centre of excellence. The summit witnessed the presence of policy makers, industry leaders, vice-chancellors and directors of renowned educational institutions of the country.